Salman Khan approved song 'Tu Mera Bhai Nahi' from Fukrey Returns is out and serves to be an ode to every friendship in India. The makers are all set to introduce the bromance anthem with its upcoming song ‘Tu Mera Bhai Nahi Hai’. Here’s the teaser to add to the excitement for the fun-filled song. 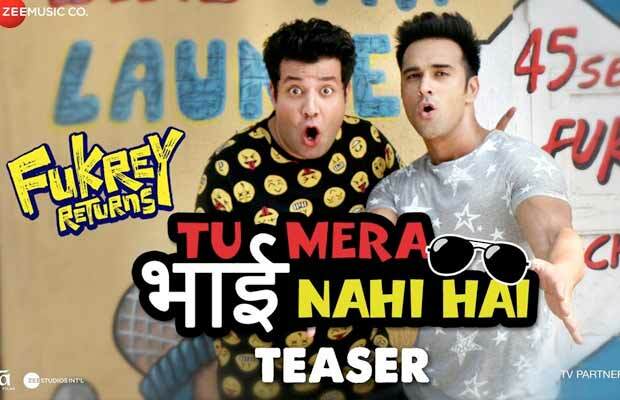 The teaser to the much-awaited, Salman Khan approved song ‘Tu Mera Bhai Nahi’ from Fukrey Returns is out and serves to be an ode to every friendship in India. The Bhai of Bollywood Salman Khan expressed his approval for the ultimate Bhai song ‘Tu Mera Bhai Nahi Hai’ during his recent visit to the ‘Fukrey Returns’ team. The quirky and interesting tilte ‘Tu Mera Nahi Hai’ has piqued everyone’s interest with its intriguing lyrics. Friendship amongst two guys is much more like brothers, which was beautifully depicted in the first installment, Fukrey. Pulkit Samrat and Varun Sharma paved their way into our hearts with their portrayal of best friends back in 2013. Hunny and Choocha have set a new precedent in bromance with their iconic yet relatable jodi. The song ‘Tu Mera Bhai Nahi Hai’ depicts the everyday situations shared by two guys and wins our hearts with its apt portrayal. The teaser intrigues the audience with its catchy and groovy tunes. The song is all set to release soon to add to everyone’s excitement. The story of four Fukras trying to make easy money pleased everyone and when the sequel was announced everyone was naturally delighted. While the audience was curious to witness the story of Hunny, Choocha, Lali, and Zafar going forward, the trailer of the film added to the excitement. The songs from the film ‘Mehbooba’, ‘Peh Gaya Khalara’ and ‘Ishq De Fanniyar’ have further added to the excitement of the audience. Previous articleAamir Khan Hosts Son Azad’s Pre-Birthday Bash At A Water Park! Next articleShraddha Kapoor Looks Overwhelmed With All The Love As She Addresses Her Fans!